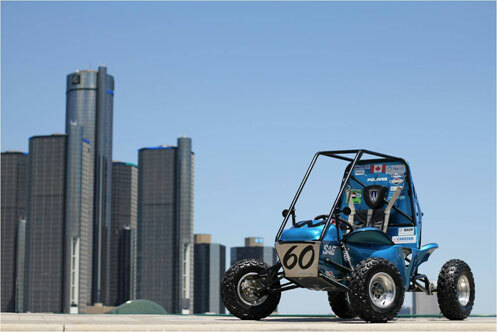 Every year since 2000, the University of Windsor's Baja SAE team is tasked with designing and building a one person, off-road vehicle to compete in one of the three national events. These Baja SAE competitions held in North America are part of the SAE's Collegiate Design Series of student engineering competitions. The four day event includes static and dynamic events that challenge teams and their vehicles. Static events include the design and sales presentation and cost report. Dynamic events include acceleration, rock crawl, hill climb, and maneuverability, as well as a four hour endurance race. In all of these events, the suspension plays a crucial role in the performance of the vehicle; therefore special attention is paid in this area during the design process. University of Windsor students use ADAMS software as the main tool in their suspension design. There are many aspects of the suspension that need to be analyzed in order to create a well handling car. For the terrain on which the Baja car will operate, large wheel travel is essential. This, however, can create a lot of losses that need to be minimized, since the vehicle only possesses a 10 HP engine. Minimizing bump steer is critical, as it deteriorate handling over rough terrain and increases rolling resistance. Bump scrub also needs to be minimized in order to reduce the losses associated with lateral motion of the wheels during suspension travel. Thanks to ADAMS, the team was able to achieve all this by analyzing the suspension and determining the exact geometry that was needed.